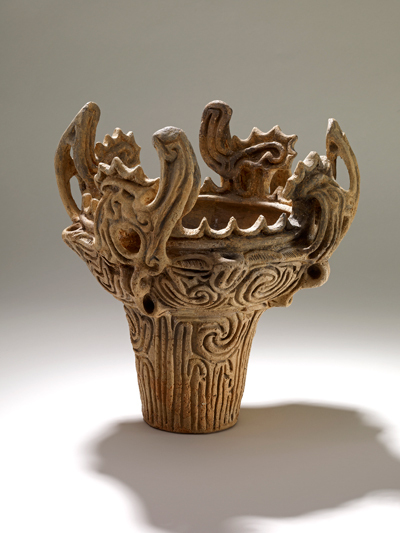 Earthenware flame pot. Middle Jōmon period, about 3000BC. Excavated from the Iwanohara site, Niigata prefecture. Nagaoka Municipal Science Museum. This event is presented by the Japan Foundation, the Sainsbury Institute for the Study of Japanese Arts and Cultures, and the British Museum. To mark a special exhibition at the British Museum of some of the most spectacular pottery vessels from the ancient world, Professor Tatsuo Kobayashi will give a special lecture at the Japan Foundation. The lecture will introduce the context within which these remarkable objects were produced and used. The Jomon period (c. 14,000–c. 500 BC) began with the making of some of the oldest pottery containers in the world. It subsequently witnessed one of the greatest outpourings of creativity in the prehistoric world, manifested in the distinctive Jomon (which means ‘cord-marked’) pottery that was made throughout this long period of time, before the arrival of wet-rice agriculture in the Japanese archipelago. 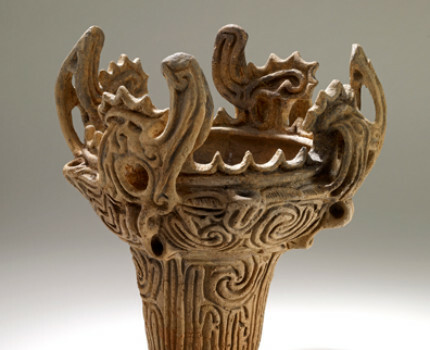 Amid the 400 or so recognised styles of Jomon pottery, the Flame pots of the middle part of the Jomon period, dating from 5300–4700 years ago, stand out for their exceptional flamboyance. This lecture will explore the pots and introduce the sites they come from, as well as presenting Professor Kobayashi’s fascinating interpretations about the lives of Jomon people, relating it aspects of later Japanese art and culture. Professor Kobayashi is Professor Emeritus of Archaeology at Kokugakuin University, Tokyo, Honorary Director of the Niigata Prefectural Museum of History, and Senior Advisor at the Sainsbury Institute. His publications in English include Jomon Reflections (Oxbow Books, 2004). His presentation will be followed by a few words from Tamai Mori, Mayor of Nagaoka City, which is where the Flame Pots were originally displayed – saké from Nagaoka City will also be available at a drinks reception following the presentations. Simon Kaner, Director of the Centre for Japanese Studies at the University of East Anglia and Head of the Centre for Archaeology and Heritage at the Sainsbury Institute, will introduce the event and act as a discussant during the question and answer session.